In perusing my “z-Old” folder on Google Drive I came across a folder called “Beat the Path.” This was the travel blog that I intended to keep and eventually monetize about my indefinite world travel (which ended up being 8 months). Well, I got too caught up in actually enjoying my travels and it kind of fizzled. But in that folder, I found 5 or 6 blog posts that I wrote and never published. (I ended up not publishing any). Pictured below is the graphic I made for my blog’s banner. Today, I would have paid someone from Fiverr to do a much nicer one. As I read these drafts, I was brought back to events that have sort of been pushed to the back of mind what with building a settled life for the past 4 years. Anyway, I thought it would be fun to post a couple of the better ones. The posts that I actually wrote back then are all rough drafts, so I’ve edited them a bit – mostly for grammar and typos.I’ve also inserted some commentary from 2018 Matthew. After a painful goodbye (2018 Matthew note: to the person of whom I am now married!) at Richmond Airport at 9:00 AM…. I was off to my travels! I got in the TSA line to go through the usual invasive routine. I placed my meticulously packed and arranged bag (so as to fit into carry-on storage bins) on the conveyor belt. I went through the superman machine (the thing where you put your arms over your head so they can body scan and irradiate you) and got pulled aside. I stared in horror as they tore apart that well-packed bag piece by piece, searching for whatever they thought that they saw that wasn’t there. Enter my layover in Boston. I left the domestic terminal and made my way to the international terminal. I got in the TSA line to once again go through the invasive rigmarole. I once again placed my perfectly re-packed bag on the conveyor belt and walked through the super man machine. Upon exiting the machine, I got pulled aside and watch in horror as another TSA agent ripped apart that well-re-packed bag looking for a water bottle that I forgot to throw away upon changing terminals. I didn’t realize that I would have to go through TSA again, so I carried the bottle with me to refill so as not to have to buy water at the airport for who knows what ungodly sum. Sigh. I board my flight to Reykjavik, Iceland, land, and mentally prepare for my 8 hour layover- ready for a nice 2 hour nap (it’s 12 AM at this point). Chatting with the nice older couple I wound up in the customs line, and accidentally left the international terminal, activating my period in the Schengen VISA area of 90 out of 160 days, which I was making a point to avoid. Since I “exited” the airport, I had to walk all of the way around the airport and go through security…. again. No bag check. Yes!.. something going my way. I spent the next 8 hours trying to sleep in every possible position I could imagine, getting in maybe an hour of total sleep, which was about as long as the sun goes down in Iceland in July. Finally the time came to fly into Prestwick Airport in Glasgow, we landed, and I exited the plane. I was greeted by a customs agent that grilled me on how much money I had and how long I planned to stay being that I had no return ticket or other way out of Britain (I planned on buying a bus ticket to Paris while end London, which I did). I now had to kill 3 hours in Glasgow before catching the bus to Edinburgh. St. George Square, the one place that I wanted to see, was closed. So I bought a local SIM card for my unlocked phone, enjoyed my first pasty, and watched some street performers until the bus arrived. Finally, I arrived in Edinburgh and followed my Couchsurfing host’s directions to her flat. First, I walked a mile out of the way on Edinburough’s main throughfare. Eventually, I found my way and made it to where she said her flat is (Argyle Park Terrance). At least I thought it was Argyle Park Terrace, but it was actually Argyle Place. Being exhausted from lack of sleep and toting a 20 pound backpack around for 6 hours, I arrived at the Argyle Place house and knocked. She said she was home and so I walked in. I walked up the stairs briefly. Nobody there. Keep in mind that these flats are old tenements, so the apartments look just like the houses. It appears that I had just done a home invasion. I apologized profusely. Luckily, he was a good sport about it and helped me find the street that I was looking for which was a block away. I arrived at Hannah’s (huzzah!) introduced myself to her and her friends and commenced with the craic – which I learned from Hanna is a Scottish term for a good time or conversation. She thought it proper to explain this as I looked on with horror that this group was talking so casually about people who have good crack. But no, that’s not where it ends. The next day we went to Sandy Bell’s pub. I was drinking with my host and chatting with some locals at the bar while listening to some Scottish folk music. Hannah (my host) then introduced me to the two other people who live in the house that I invaded at Argyle Park Place, Shirley and Kieth.We chatted a bit talking about the irony and exchanged numbers. I got “snackered” (Scottish speak for moderately insensible) with them and their friends the next day. And who says crime doesn’t pay? Networking is very important for success. This is pretty common knowledge. It’s not what you know as much as it is who you know. LinkedIn and other social networks are good up to a point, but nothing can replace planting your mug in front of folks. It’s an entirely nerve wracking experience. Through a lot of research and sucking it up and attending some of these things, I have learned a thing or two. I am now perfectly comfortable in these types of environments. So, in an effort to reach out to those who need to do this in-person networking type stuff, but have all of the same fears that I did, I am making this guide to assuage those anxieties and give you some tools to function well at these type of things. I am by no means a master networker/connector/anything like that, but I have been in the shoes of people who are terrified by the prospect of having to attend something like this and want to help. I will put forth that I am working from a base line of general extroversion and thriving pretty well in small groups, even if it is strangers (events with 7 or more people still intimidated me to the point of not attending). I get that I was a little higher up on a comfort scale than many who will have to attend these things, but we all start from somewhere right? The number one thing that I learned from looking up the abundance of articles on how to cope with these anxieties was that I’m obviously not the only one who has them. Most of the people at the event that you are attending aren’t social butterflies who can shake hands, slap backs, and work a room like a politician during election season. A lot of them have the same anxieties about working a room full of strangers that you do. Take solace in that. You are not alone. 2. Consistency in attendance. Don’t try to meet everyone in one night. A popular misconception about these events is that you have to “make the sale” right then and there. You have to go there, pitch your product/service, and hand out business cards to everybody in that room before the nights done. It’s not a one and done prospect. Your best bet is to choose 1 or 2 groups/organizations, show up to all of the events, talk to a few people at each event until either the event is over or the conversation dies (more on striking up conversation later), leave. If you hit it off, or have something further to talk about with those folks, then follow up after the meeting and set something up (more on that later). If you don’t have any interest in a relationship with them, then don’t follow up. Say hi to them at the next event. You should try to remember people’s names (I am not known for being good at this), but if you don’t, it’s fine. They probably didn’t remember your either. And if they do, it means you were memorable and interesting. Hopefully the event has name tags that you can try to subtly check out. At the next event, do the same exact thing. Have good conversations with a few people. Follow up or don’t. Over time you’ll have met several people at these events and a lot of people will know you. The important thing is to not spread yourself too thin over several random groups. I already sort of have issues with this because I have real estate investor groups as well as history-based groups that I try to balance, but they can be somewhat related since I work for a General Contractor. 3. How the f*** do I get into a group of people to talk with them? This is always one that made me feel the most awkward. A couple of people or a group of people is standing around having a conversation and you don’t want to just stand there and be weird. 1) If the group is a closed circle or two people are facing each other square, then they’re really deep into a conversation, do not go in. 2) If there is an open space in a group, or two people are standing and talking in sort of like a V with their bodies angled out into the space in an open sort of posture, then they are INVITING somebody else to join. Just stand in that spot and start listening. It’s not awkward, that’s just how you insert yourself into these conversations. Eventually somebody will introduce themselves to you which is your invitation to meet the group, shake hands, exchange names, and make with the chit-chat (more on what to chit-chat about later). If no one introduces themselves to you (odds are slim that they won’t) wait until a conversational lull, throw out a hand and make an introduction. You just have to get over yourself. Personally, I prefer groups of 3 or more. The conversation is less likely to die down when there are more people. One thing that I always try to do as a former Networking-ophobic is to always make space for someone who even kind of looks like they are alone and trying to join the conversation circle. Even going so far as to invite them in. It’s actually a really interesting dynamic. The group will expand into a circle, and as it reaches critical mass to where there’s like 8 people in a giant circle, side conversations begin and the circles divide like a single celled organism splitting itself. If you see a person standing by themselves they are fair game. Go and strike up a conversation about whatever. If anything, they may be that awkward person who isn’t sure how to approach people and you have made the event much better for them. And they might have a lot to offer and be an interesting person. 4. What do I talk about? NOT yourself. What brings you here today/tonight? This is pretty obvious. The one thing that you and this other person have in common is that you are both there for some reason. This can lead to all sorts of off-shoots of topics. What do you do? : Basic questions. It’s a baseline. Sometimes they can give you enough with this where you can riff of of with questions for a while. For example “I’m an architect” can be followed up by “What sort of buildings to you design?” “What got you into that?” “Where did you study” and you can just go on asking questions. Where are you from? : You could share something you know about it and ask them about that, talk about a place that’s somewhat close and ask if they’ve been, you can ask why they left, where they went to college, etc. The important thing to remember is to have a genuine interest in the person’s story. Personally, I love knowing people’s stories and all about them. You can ask a ton of questions and go pretty deep without touching on sensitive subject matter. If they mention that their parents passed away, I wouldn’t ask “how?” Or something along those lines. This is a basic tenet of the seminal self-help book How to Win Friends and Influence People by Dale Carnegie. 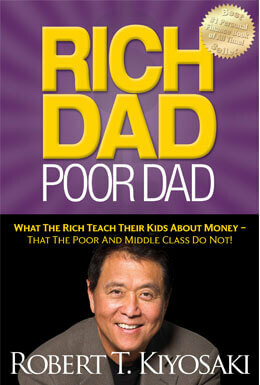 It’s a classic and everybody should have read this at least once. Also, if the person really has nothing interesting you can probe about… see the section on ending conversations. Of note, unless it’s a political event, or a religious event, don’t talk politics, religion, or anything that could possibly put you at odds with someone there on a personal level. A lot of time you get caught up in a situation where you guys have nothing left to talk about. You can both tell that the conversation is ending, but not quite sure how to separate. You look around to try to bring somebody else in to freshen up the conversation…nobody. “Well, it was great talking to you!” And move on. Yes, it’s that simple. You are both looking for a way to end the conversation and move on to something else, it just takes someone with the balls to acknowledge that the conversation is dead and rip the band-aid off. You will be relieved, they will be relieved. If you want to be non-confrontational about it, or this seems too sudden then the following solutions are available to you. (These also work if it’s someone who is just yammering about bullsh*** or is uninteresting). 1) “It was nice talking, I have to get with so-and-so to follow up about (X)” And go join another group or person. Even if you don’t know them or have anything to talk about, just start a new conversation. It’s much better if it’s somebody you’ve met before though, so you can catch up. 2) “I have to run to the restroom.” Go to the restroom. If you don’t have to go, just look in the mirror and make sure your tie’s straight. Also, maybe wash your hands since you’ve probably just shaken a bunch of hands. You can only go to the well with this one so many times before people have seen you run to the bathroom 4 times in an hour. 3) “I’m out, I need to go grab a drink” Keep a small amount of drink in your glass, finish it, and use the old bar excuse. Get caught up in a conversation with someone else at the bar. Once again, I emphasize, everybody is at these things to network, so most people will be on the same page with you of trying to talk to more than one person, or ending a conversation that’s going nowhere. Okay, so you’ve made a connection.You and the other person either get along great, or can potentially do business. This is probably the most important part. Admittedly, since I’m new to the whole networking event thing, I have substantially less experience with follow up. This is also an area that I need to work on getting better at. Thus, I present to you this Forbes article that I have found to be accurate based on experience and podcasts such as the Art of Charm that I have listened to. If you have met someone earlier in the event, or during a different event for the group and meet someone who they might have a common interest with, introduce them! Even if you don’t connect with these folks automatically, they will remember that you are the one who introduced them. Even if they don’t associate their acquaintance with you, you have helped some people out and have built up some good karma. Enjoying a cocktail or two is fine, but don’t be that guy/girl who gets drunk to deal with the fact that they can’t handle social situations. It’s a social lubricant up to a point…. break up your drinks with water to hydrate. That’s about the gist of it. The most important thing to remember is that anything that you’re feeling as far as anxiety, awkwardness, whatever.. you’re not the only one. And once you are comfortable moving about a room at a networking event, be sure to make room for or talk to the person standing by themselves awkwardly staring down at their drink and introduce them to some other folks. 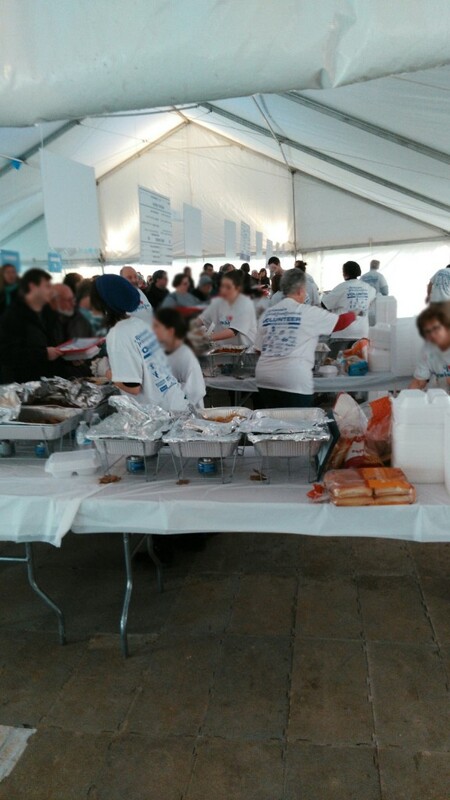 It is the 7th year for the Richmond Jewish Food Festival… and it gets better every year. The festival had it’s beginnings in the Kiniseth Beth Israel Temple… after 5 years, it got crowded and moved to The Weinstein Jewish Community Center. I had never been to this festival before and was expecting long lines to get the food. The line was long, but it went by swiftly. On the left is Cholent, which is a traditional Jewish stew made as an end-around of not being able to cook on the Sabbath since this stew could feed everyone for the whole day. It’s ingredients are as varied as the people who make it and can include, lentils, beans, rice, various meats (not pork, of course), rice, barley, oats, etc. On the right is a Knish which is a filling inside of some dough that is either baked or fried. Mine was filled with what looked like Potato, but I guess it can contain everything from rice, to meat, to veggies. There is of course the brisket, which is smoked beef. The other sides that I got were the Cabbage Roll…. a ground beef, tomato, rice mixtures stuffed inside of cabbage which has become to underdog hit of the Jewish Food Festival over the years. Also, no Jewish food festival is complete without Latke’s, the famous and delicious potato pancake. 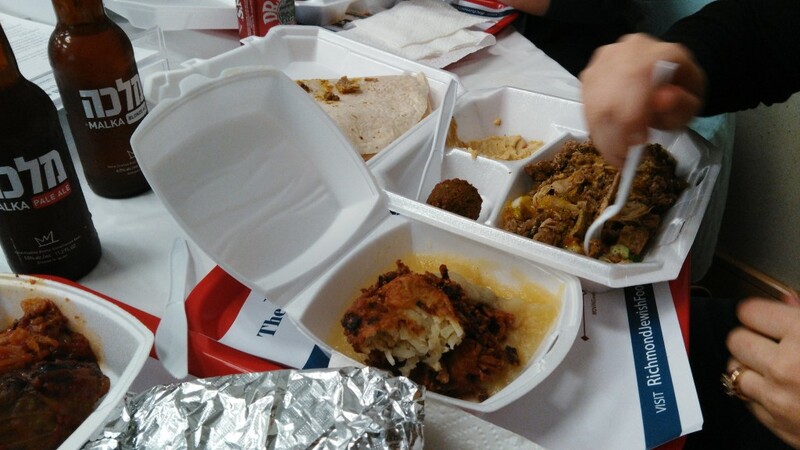 We also got the Israeli sampler which was Shwarma (meat grilled on a rotating stick and shaved off and stuffed into a tortilla type thing) and Falafel (Mashed, fried Chickpeas). All with a bit of Hummus. Entry to the event is free and the total for all of this food (and it was A LOT of food) plus two beers was $47. The Brisket Plate with 2 sides is only $13. A steal. Bubbie’s Bakery provided lots of sweets and treats. Personally, I can’t go without some Baklava and a couple Macaroons. What really struck me was how organized the whole thing was. There was a really long line that moved very fast. Once you got to the front, you were sent to a certain numbered booth (all of the booths sold the same thing) with your group to get your food, then there were 6 or 7 registers set up to take payments. It was all very streamlined which I’m sure was developed over several years of trial and error. There was also several vendors selling various items, Jewish music, and some information on the Jewish culture. Richmond actually has a long history of a Jewish population, but that’s another story for another post…. If you’re a local, or you are visiting Richmond, it’s definitely worth checking this delicious food festival out. 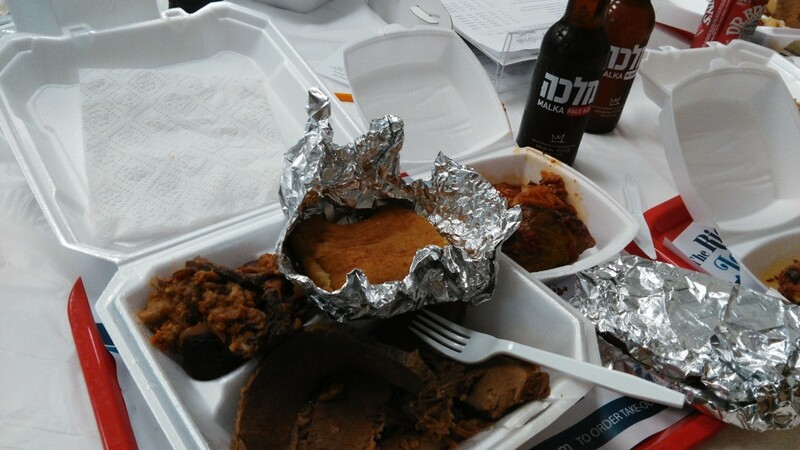 You will not find good, homemade Jewish food like this anywhere else in Richmond.